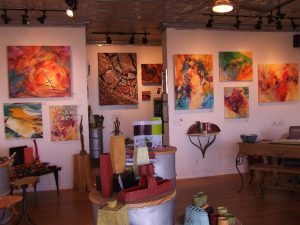 Here are shots from my exhibit, “Gifts of Soul,” at Gallery 527 in Jerome, Arizona, December 2016 through January 2017. 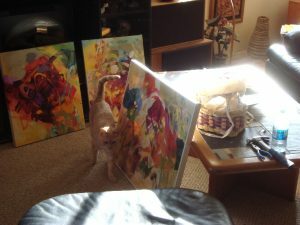 There’s something sweet about the quiet time wiring my paintings and making sure they’re signed before a show, accompanied by my furry friend Link in the sunshine. 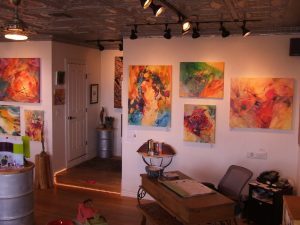 Freshly hung “Gifts of Soul” show at Gallery 527 in the artist colony tourist destination of Jerome, Arizona. 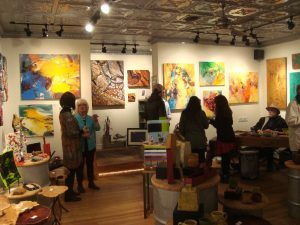 Always an enjoyable crowd at Jerome’s First Saturday Artwalk, which serves as the opening reception. 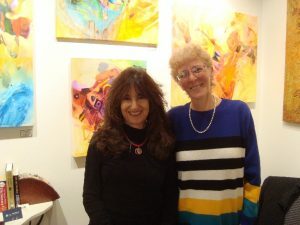 Gallery 527 owner Donna Chesler and me, Julie Bernstein Engelmann. After the show opened, I became bugged by the upper right corner of Constellations of Support, the large red angular painting on the upper left. 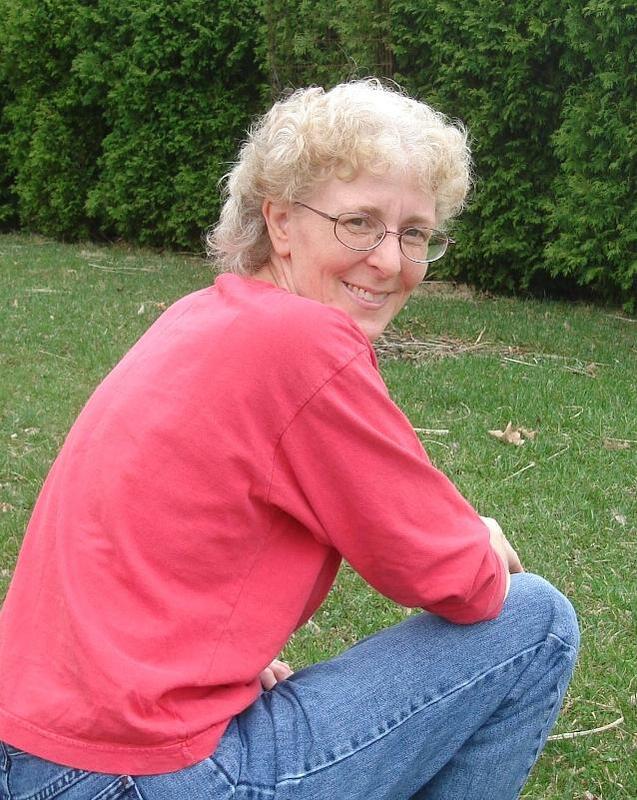 So in the next shot you’ll see I switched it out temporarily to tweak it (a little bluer). Here the second Artwalk for my show is getting started. 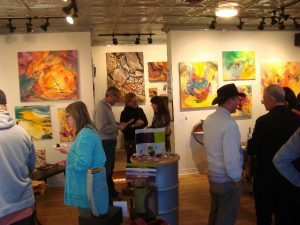 Two fellow gallery artists stand at left: dark-haired Sharron V. Porter painted the dimensional pieces in the center rear, and blond Ardis Harsche created the encaustics on the right wall. That shady dude at the desk is my husband Chip. 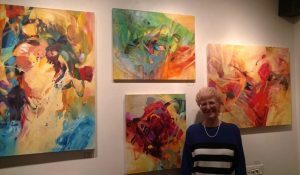 This entry was posted in Events, Exhibits, Galleries, Julie Bernstein Engelmann News on January 28, 2017 by Julie.